In mid April over a thousand Members and Medallists of the Royal Victorian Order will gather in St George’s Chapel for a service of Praise, Remembrance and Dedication. The service takes place in St George’s once every four years because the Chapel of the Order (The Queen’s Chapel of the Savoy in London) is too small to accommodate the number of people who attend. St George’s is the home of the Order of the Garter. For more information about the Order of the Garter please click here and for more information about the Royal Victorian Order please click here. 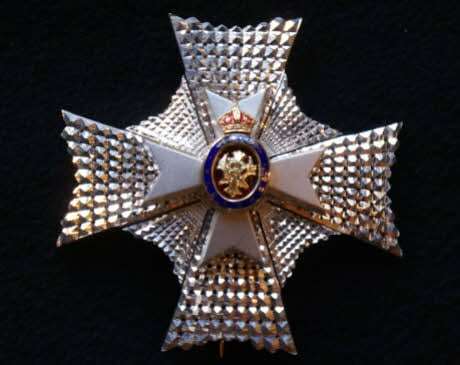 The Royal Victorian Order was instituted on 21 April 1896 by command of Queen Victoria to enable her to acknowledge and recognise personal service to The Sovereign. Appointment to the Order remains at the discretion of The Sovereign. There are four Officers of the Order: The Chancellor is the Lord Chamberlain, the Secretary is the Keeper of the Privy Purse, the Registrar is the Secretary of the Central Chancery of the Orders of Knighthood and the Chaplain is the Chaplain of The Queen’s Chapel of the Savoy. The service is a collaborative one with musicians from the two Chapels working together and the Virger (of St George’s) and the Verger (of the Queen’s Chapel of the Savoy) both leading elements of the procession. The photographs, both on the Homepage and below, show the neck badge and star of a Knight Commander of the Royal Victorian Order.